It was never going to be a decision to take lightly. That football table had been part of my life for so long. I can’t think of a year in which it hasn’t seen active service. And every two years since the mid-90s it’s enjoyed a summer rejuvenation at Wyatt Manor. I don’t recall when it first showed up, but it was a big investment for the folks and played an important part of our family life in South-West Surrey in the 1970s and 1980s. When I moved North in 1994 it came with me, and despite the odd stint in the loft at my last house or the garage at my present abode, it soon re-discovered its rightful place at the heart of our operation, at least every other summer. Every Euro Championships from England in 1996 through to Austria-Switzerland in 2008, and every World Cup from the USA in 1994 to South Africa in 2010 has had it’s table football equivalent here, and anyone who visited us during those tournaments played their own vital part in those proceedings. Can it really be two years since the Ivory Coast upset the bookies to secure their first-ever World Cup victory in Daftown, Lankers? My ears are still whistling from the over-exuberance meted out by those cheap vuvuzela copies blown in my general direction. But time sails on, and now we have to wonder just who will come out of the pack to secure European gold next month. And with no one getting that excited about Coy Hudson’s Ingerland team so far, maybe the year has finally arrived in which we exceed all our expectations and at least reach the final. For every bit of magic in the official tournaments since I moved to Lankers – like Gazza’s wonder goal against Scotland in 1996 and Andres Iniesta’s winner for Spain in 2010 – there have been moments of note to savour here too. And more are expected this summer. There have to be ground rules of course, and the authorities have been tough over the years. The ‘no spinning’ rule has been particularly heavily executed, but has no doubt added a few years to the original table. The rods are still pretty warped, but they’re all in one piece and that really is something to be proud of. But a couple of weeks ago a cursory look at the Table of Dreams in the garage led us to the sorry decision that it really would have to be rested up and considered as an exhibit for the newly-relocated National Football Museum in Manchester instead. Over the years we’ve seen signs of age accelerate, not least when one player did a Sammy Nelson and brought a tournament into disrepute as the back half of his shorts dropped off. We’ve also witnessed the Brian McDermott, Clive Walker and Mickey Thomas effect in evidence, players once sporting a full head of hair returning for the next tournament as bald as coots. But a few persevered with the old looks, not least those players with ponytails, something which must have given ‘80s throwback Sandy Barrel the hope he needed that he would be included in this summer’s Ingerland squad. There have been other problems too, not least the fact that after every tournament the official ball has been put in a safe place that no bugger can actually remember come the next big event. But the show must always go on. Yet this time, we instinctively knew it was just too much to expect the crumbling table to make it through another games marathon. “That’s something you can look for on ebay,” remarked my other half, seemingly nonchalant but hurting as much as I was, having spotted the perilous state of the table while searching the garage for something neither of us could remember we’d gone out there for. But we both knew it was the right decision. Three minutes later I was back in the house, entering the search term ‘football table’ on the computer. Within seconds a page of results appeared, and one seemed to jump out. Okay, the teams were blue and red rather than yellow and red, but I could live with that. I quickly clicked on for more details, having seen there were only seven minutes to go and one bid was already in. It read ‘pick-up only’ so I naturally expected it to be located in Leighton Buzzard, with no chance of a drive-over in these times of over-inflated diesel prices. But the table happened to be in Hindley Green, barely 15 miles via the A49 from Daftown. The dream was still alive. Before I knew it, I’d put in a cautious bid and after a later panic – lack of faith, some might say – added a back-up tender in case there was a late flurry of excitement. 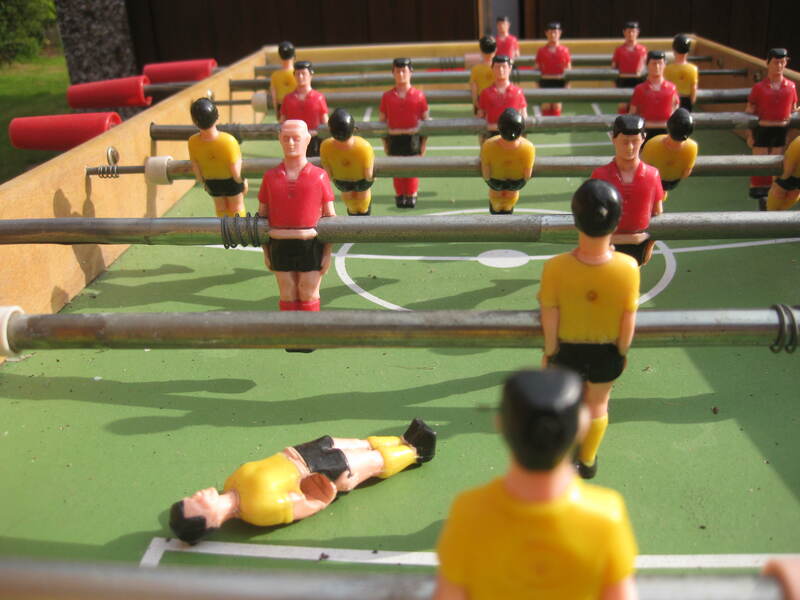 Yet no further bids surfaced, and within a few minutes I had a new email announcing ‘Enjoy your football table’. I’d won the item. Not only that, but fate had clearly played a part and I saw that the seller was a fellow Wyatt. Uncanny. Two days later I drove down to collect my purchase, heading around the north-east fringes of Wigan’s coal-belt to locate the right address. I recognised most of the places I passed from my days editing amateur rugby league copy for the Wigan Evening Post a few years before, and at one stage broke into a cold sweat, wondering if the table might have rugby posts instead. I need not have worried. I finally tracked down my namesake, keeping my emotions intact as I gave his lad a few words of solace. But he seemed happy enough in the knowledge that the proceeds would go towards his first iPad, on the weekend Wigan Athletic had again defied gravity and retained their Premier League status. The rest should be history, and only time will tell if the New Table of Dreams (note: no sponsor so far, which is just the way we like it … although we are open to offers, and talks are currently underway with a local chip van) will provide any of the success its predecessor had. In the meantime, Yooro 2012 preparations continue behind the scenes, and we have a warm-up game scheduled for this Saturday, when Bobby Dee Madonna’s blues Chelski, take on the red shirts of Bayern Munchausen for the Yooropean Cup Final. It would be wrong for me to reveal my tip for the trophy at this stage, but I have a sneaking suspicion that there can only be one victor. 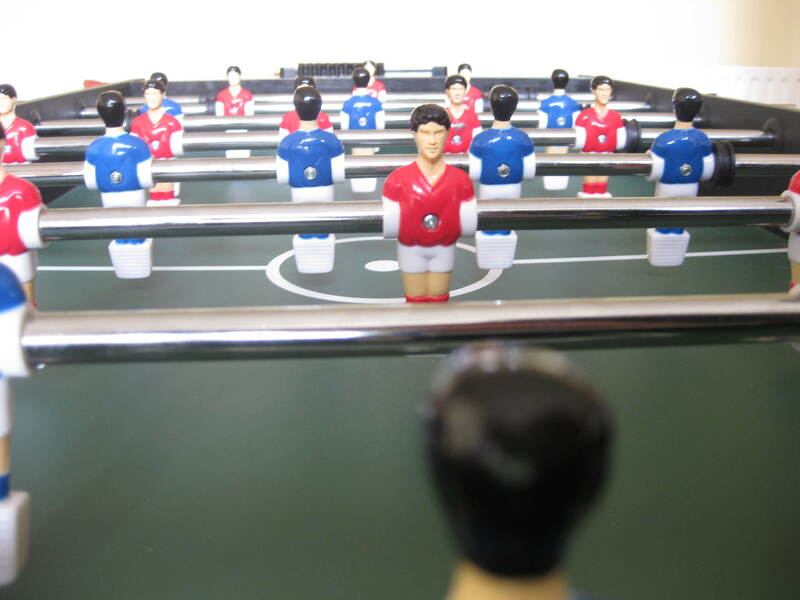 And table football will always be the winner.